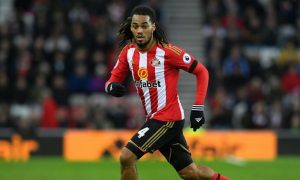 Manchester City defender Jason Denayer will miss the next 6 to 8 weeks of action after picking up a hamstring injury playing for his loan club Galatasaray at the weekend, according to reports in Turkey. The 22-year-old has been enjoying a run of games for the Turkish giants, but pulled up in Galatasaray’s 2-1 defeat to Sivasspor on Sunday, and the news now is that he could be out for as long as two months. Denayer, capped eight times by Belgium, is currently on his fourth loan move away from the Etihad and second at Galatasaray, with the likelihood now being that he will be sold by City in the near future. He spent last season in the Premier League with relegated Sunderland, often playing as a midfielder rather than defender, and clocking up 27 appearances in all competitions. Anderlecht explored a move for their former youngster in the January transfer window, but he has worked his way into earning more starts at the Türk Telekom Stadium, and this injury blow comes as a major setback for him. We’re on the march with Guardiola, we’re all going to Wembley! Check out the City Store’s exclusive range of Carabao Cup final merchandise ahead of the big game!